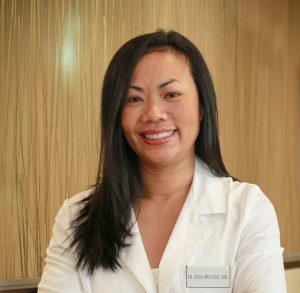 Dr. Lydia Muccioli was born in Korea, daughter of a U.S. Army service member father and native Korean mother. She spent half her childhood abroad in Asia and the other half in Georgia and Alabama. She graduated with a BA from Jacksonville State University and went on to Dental School at the University Of Michigan School Of Dentistry. Upon enrolling into dental school, she was awarded the U.S. Army Health Professions Scholarship which paid for her dental school education. In return, she served three years as a Dental Officer in the United States Army. During her military career, Dr. Muccioli completed a One-Year Advanced Education General Dentistry Residency. This program gave Dr. Muccioli advanced training in the areas of endodontics, periodontics, prosthodontics and surgery. Her assignments included a one-year tour overseas in Korea and then the Pentagon. At the Pentagon, she was handpicked to run a clinic responsible for treating General Officers of General’s Row, those attending the National Defense University and the military staff to the White House. Upon leaving the military in 2002, Dr. Muccioli worked in private practice in the Washington D.C. area until she moved with her Dental Officer husband to Augusta Georgia. From 2005 to 2011, Dr. Muccioli worked on two separate Army installations as a civilian dental provider. The first was at Eisenhower Army Hospital treating the Medical Providers and auxiliary staff of the hospital. The second location was Fort Stewart Dental Clinic. There she worked in a multidisciplinary clinic preparing soldiers for the many deployments to Iraq and Afghanistan. This was an amazing highlight of her career and Dr. Muccioli knows of no higher honor than to have cared for and treated the men and women who serve our country during a time of war. Dr. Muccioli has recently moved to the Atlanta area with her husband and two sons. She is looking forward to raising her children here and becoming involved in the community. She is a member of American Dental Association, Georgia Dental Association and Academy of General Dentistry. She is currently working toward her mastership of the Academy of General Dentistry. Dr. Muccioli believes in building relationships with those she treats and is committed to delivering the highest standard of comprehensive care to her patients.